Choose ELISA kits for plant virus diagnostics from an extensive range offered through Bioreba. One of the most common virus affecting grapevines. The ELISA kits have been developed with high quality full spectrum reagents for detection of GLRaV-1 consisting of different complementary monoclonal antibodies. This is one out of several viruses associated with leafroll diseases occurring on grapevine cultivars. GLRaV-3 is one of the most common disease affecting grapevine worldwide. The broad spectrum ELISA reagents have been extensively tested with virus collection from New Zealand, South Africa, Switzerland and USA. GLRaV-1 and GLRaV-3 are the most prevalent ones among the grapevine leafroll diseases. Through the DAS-ELISA method allows for the detection of both GLRaV-1 and GLRaV-3. 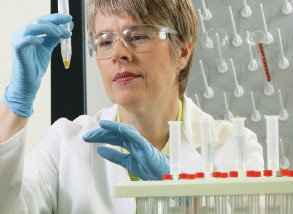 The reagents have been extensively tested with virus collection from New Zealand, South Africa, Switzerland, and USA. GVA is associated with the Kober Stem Grooving disease affecting grapevines and is responsible for considerable crop losses. GVA reagents consist of polyclonal antibodies to cover a broad-spectrum of GVA. Antibodies in this kit are made against isolates to specifically detect GLRaV-4 strain 6. These viruses cause poor development and non-uniform maturation of fruit, and downward rolling of leaves. These bags are ideal for issue extraction to be used in ELISA and PCR. The homogenizing system includes four sizes of extraction bags with or without a synthetic intermediate layer. GFLV is a grapevine pathogen and spreads over medium and long distances in infected propagative material, soil and between plants in the field. Choose from semi-automated, or hand model of homogensiers. Hand model can be used with all extraction bags and is suitable for small sample numbers and samples such as leaves, sprouts, flowers etc.